Blade Crafter is a popular RPG for mobile by Studio Drill in which the player craft, upgrade the legendary weapons to strike down the enemies, boss. The game comes with simple mechanics and challenges the player to beat the enemies in hard stages. Game mechanics include crafting, enhancing, enchanting, skills, and more. And battle mechanics are also quite simple; all you need to do is tap the blade to release and the weapon automatically strikes the enemies. Additionally, as you unlock new weapons, new skills will get unlocked. If you are having trouble winning the stages or looking for some Blade Crafter tips, cheats, then we are here to help you. In today’s post, we have covered everything about the game you need to know: Blade Crafter guide and Blade Crafter tips, cheats & stratgey. Before we dive into the cheats, tips part, let’s learn the basics first. In Blade Crafter game, your main objective is to unlock legendary weapons as fast as you can, complete all the stages, defeat the enemies in the boss mode. Like other games, In this game too, the difficulty level increases as you progress. Enemies will become stronger and you will need better weapons. How To Obtain New Weapons? First of all, you need a free weapon slot. Go to the weapons tab, at the bottom, buy an empty slot for the weapon. After buying, tap the craft button to craft the weapon. For crafting, you need resources; copper, iron, silver, and more. These resources can be obtained from the field. Each time you craft, you get Dagger weapon. Dagger is the poorest weapon in Blade Crafter with the durability of 100. To unlock a new weapon, you will need to evolve it. And to evolve, you will need to enhance it using the gold. For example; Dagger evolves in Kris, Kris evolves in Stiletto, Stiletto loves in Gladius, and so on. What Would Be The Impact Of Enhancing, Enchanting, and Evolving? Enhancing – Enhancing increases the attack, durability of the weapon. The durability of the weapon determines its life. In the battle, when the blade strikes the enemy, it loses a small amount of durability. To defeat powerful enemies, make sure to increase the weapon durability and attack power by enhancing. Normal – In this mode, the cost of enhancement would be low as compared to the perfect mode. But if the success rate is low, then chances are it would not upgrade. Perfect – In this mode, the cost of enhancement is high. But it will not result in failure. Additionally, you could get an enhancement boost. Enchanting – Enchanting is different from enhancing. In Blade Crafter game, by enchanting a weapon, you can activate its special buffs. For example; Weapon speed, attack power, gold drop rate, and more. Just above the enhance button, tap the wand button to enchant. 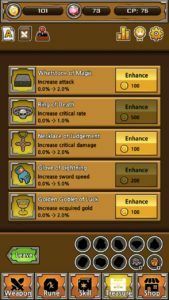 By enchanting again, you can change the special buffs. But keep in mind that these buffs are not permanent. As you clear or participate in the stages, the buff’s status will reduce. Go to the weapons tab, there you can check the purple meter which highlights its status. Evolving – After a certain number of enhancing attempts on a specific weapon, you will be able to evolve it. Evolving unlocks a new weapon. Evolve the same weapon again to get another new weapon. So this is the Blade Crafter weapon guide. Now, let’s learn about the skills, runes, relics, and battle. In the battle, you just tap the blades to attack the enemies. You can increase the weapon speed by tapping the screen. The two main things are MP and skills. To use the skills, you need mana points(re-generates at every stage). Tap the skill button to unleash the skill. After a usage, you will need to wait until it charges up again. 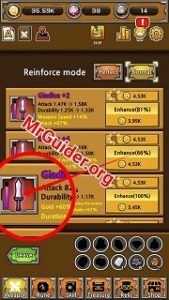 Rune is another one of the main items in Blade Crafter game. You obtain this item from the stages. Repeat the stages to obtain more. These items can be equipped in the rune tab. Go there and equip. Each rune activates a special bonus to the weapon. You can enhance the runes using enhancing item. You need ancient sculptures to summon relics. How to obtain? Play the boss mode in the game to get this item as a reward. Once you have enough, go to the relic tab -> use to get the relic. Relic items can also activate the buffs. Skills can be unleashed in the battle. All the skills provide different bonus effect. For example; Arkane Hammer skill can restore the durability of the weapon. You can unlock new skills by enhancing existing skills. Blade Crafter game features two mini-games. Tap the game-controller icon at the top of the game screen -> in the first game, you match the cards and win items. And in the second mini-game, the player catches the monster. Play these games for additional rewards. Blade Crafter is one of the best RPGs, comes with low MB size and features a mini-game also. It is a crafting game in which you craft weapons and kill enemies to earn gold. You invest earned gold to enhance skills, weapons, and other add-ons. Blade Crafter game features 45 types of sword and your goal is to craft or unlock all these swords as fast as you can. Our Blade Crafter cheats tips and a simple guide will help you to achieve this goal fast and easily. Before we continue, let’s learn about the basic of the game; procedure/process; what type of tasks you have to complete and how you can achieve them fast. This post is divided into two parts; Blade Crafter cheats tips and Blade Crafter game guide. You should read both parts even if you know about the game. Let’s start the Blade Crafter guide first. In Blade Crafter, your main task is craft and unlock new swords/weapons, enhance the crafted weapons, increase the skill power, attack power, and speed. To achieve these goals, you need a huge amount of gold which can be obtained by playing battles, completing quests, by playing the mini-game and completing achievements. In the battle, you just tap on the sword and navigate it to kill enemies. Your weapon’s durability is fixed and it can not last for a long time. Once its limit crossed, the battle ends. So to complete more stages continuously in Blade Crafter game, you need some powerful swords/weapons and these weapons or sword can be obtained by crafting[don’t forget to read cheats below]. Under this section of the Blade Crafter game, you can craft weapons/swords. First of all, you have to buy it; to add a new slot to your weapons list and then you need to craft it using various types of sources. Blade Crafter features 45 types of weapons and these number might be increased in the future updates. The very first weapon is the dagger, in the Blade Crafter cheats tips section, I have explained how you can increase the performance of weapons and unlock new weapons. Rune is another one of the main items in Blade Crafter, used in increasing the attributes; attack, damage, and more. You can acquire rune through battles. To equip runes, go to the rune section of the game and tap on equip button. To increase its performance, enhance it. There are six types of skills featured in Blade Crafter; Arkane Hammer, Aura Blade, Lightning Storm, Eagle Eye, Mortal Blade, and Meteor. You can unlock these skills by leveling-up the already unlocked skill. For instance, to unlock Meteor skill in Blade Crafter, you need to upgrade Mortal Blade to level 3. Under the treasure section of the Blade Crafter game, you can enhance various types of items to increase the attack, critical rate, sword speed, the gold amount, and much more. Just enhance these items and complete stages fast and earn more. Under the shop section of Blade Crafter, you can claim your free rewards; I got the auto attack feature for free. From the shop section, you can earn free gems and gold by watching the video ad. So this is the simple Blade Crafter guide for beginners. Now let’s start the Blade Crafter cheats tips. As you know, you need powerful weapons or swords to defeat the enemies at higher stages. For this, you have to upgrade your weapons or swords. There are two types of upgrades; enhancement and enchantment. Enhancing a weapon in Blade Crafter increases the attack and durability. Enchantment a weapon increases the add-ons power-ups and skills; critical damage, the gold amount per kill, weapon speed, and more. So make sure you are paying attention to both. One single powerful weapon or sword helps you in clearing many stages fast and you will be able to defeat powerful enemies at low durable cost. To unlock a new weapon, you need to enhance the weapons to their maximum level. For instance, at the beginning of the game, you have a Dagger sword, enhance it to its maximum level to unlock Kris sword. Enhance Kris sword to its maximum level to unlock Stiletto sword. And similarly, enhance the Stiletto sword to its maximum level to unlock Gladius sword. And so on. To unlock new material such as silver and more, you just need to upgrade your sword and clear all the stages. The Blade Crafter game also features a mini-game, tap on the game controller option at the top of the screen, choose the game[just tap on the card left side] and play it. You can earn a huge amount of coins and gems for free in Blade Crafter game. It is a match card game; select the same card within the time limit. Just take the screenshot instantly to match all cards within the time limit and earn a big amount of gold and gems. Upgrade the skill to decrease the cooldown time and its main task. You have limited mana for the battle and to activate each skill, you need mana. For instance, at the beginning of blade crafter game, Arkane Hammer skill requires 32 mana and you have a total of 50 mana. 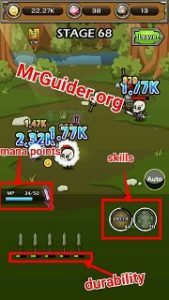 If you use it, you will lose mana and you can not use the skill again if you have no enough mana. Mana generates automatically after clearing the stage. So use the skill at the right time, for instance, if you use the Arkane hammer skill at the starting when your weapon durability is fully charged, it does not make any sense. Using it when your weapons need recovery, you can complete hard stages fast and easily.